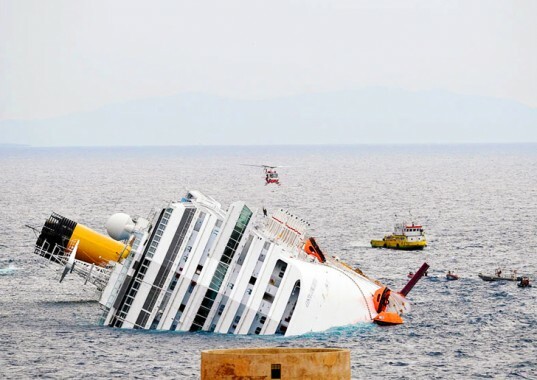 UPDATE 20.02.2012: as the anonymous commentator below says, with the wreck of the Concordia, Cassandra may be reminding us in a whisper of what she shouted out 100 years ago with the Titanic, and, less obviously, with the Concorde disaster. But what else should we expect in our titanic world: for as much rhetoric about peace and harmony as there is today, titans are by their very nature not a concordant group - and when humanity becomes for a period titanic, then manifestations of egoism on a monumental scale are the result. These in turn can only ultimately result in disaccord and catastrophe. For those who have ears: Cassandra's warnings are only mild foreshadowings of what must come with the inevitable fall of the titans and what must happen to the human constructions and attitudes that follow the titanic model. For those interested, this is all preeminently explained by F.G. Jünger in his Griechische Götter. From 03.02.2010. This is a rare departure from the anarch theme - but I saw a newspaper article today relating that the Concorde disaster of a few years ago was probably caused by panels of titanium lying on the runway and I simply can't resist! In various places in his work, Ernst Jünger speaks of the prophetic message in the Titanic's fate. In his words, Cassandra has hardly ever spoken as unambiguously: in the name of the ship; in the overweening technical pride associated with it; in its sinking on a maiden voyage between the Old World and New World. In the current return of Titan forces, technology is the key to their worldly powers - and they use it without restraint, to its absolute limits, without concerns for balance and "sustainability", to resort to a popular word. Humans living in this Titanic phase become intoxicated by their seeming mastery over all things as a result of technology. Their pride swells, nothing seems impossible. They have become like the gods, masters over nature. And so they build ships like the Titanic and airplanes like the Concorde - unsinkable, masters of vast spaces, luxurious even as they break the speed of sound at 10,000 meters or cross the icy Atlantic to the accompaniment of lobsters, champagne and Dixie music. Titanic humanity takes great pride in such achievements - but then disaster strikes! 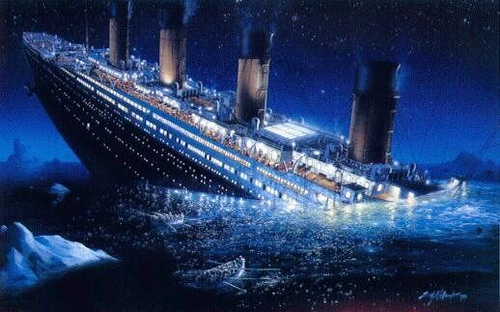 The unsinkable Titanic, the pride of humanity, is destroyed by a simple iceberg on its maiden voyage. 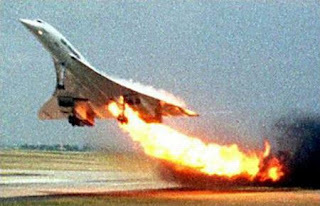 And now the Concorde, its equivalent of the air, is brought down in a flaming inferno by random bits of technical junk, made by its parents' and baptized with their name. With the Titanic, Cassandra spoke loudly to the whole world - with the Concorde's felling by titanium it is more of a whisper to the initiated, to those who listen for her signs. There is much of prophetic about the disaster of the Titanic, just think to the book by Robertson, written in 1898, which told about the wreck of a great oceanic liner called Titan against an iceberg. Interesting post. Have you read Heidegger's The Question Concerning Technology? Thanks for the link - I did not know about the Robertson novel. And I still need to read Heidegger's book - on my list, thanks! Good post. A Roman poet said something like "The giants fall by their own mass". Corresponding to the Titans, the Indian have the Asuras. Their saying goes: "The Asuras are too heavy for the earth to bear." As you have written, the Titans can't keep the balance. There is a LAW that demands balance, which then strikes. When the Greeks and the Indians independently come up with two equivalents myths, there has to be some truth to them. I don't know the Icelandic Sagas, but I can only imagine they have their equivalent of the Titans/Ausuras. I watched an Arte special last night on Hiroshima - made me remember what a demon the Titans have unleashed with the atomic bomb! So far, they have been fortunate in keeping a fragile balance with this ultimate power - let us pray they fall before losing balance with this bomb in their hands! In April 1912, the RMS Titanic -- the symbol of modernity's pride and conquest over nature -- was sent to the depths by an iceberg (as you say, almost every detail of this event has a striking, archetypal quality). Also let us not forget the other infamous British ocean liner, the RMS Lusitania (named after a Roman province which in turn is believed to have derived its name from the Greek "Lyssa", the spirit of rage and frenzy). The sinking of that vessel in May 1915 helped fuel the rage that was to become the first War of the Machines. You suggested that the piece of *titanium* that brought down the Concorde was a whispering reminder of the booming shout that was the Titanic disaster. The connections are indeed uncanny, but they do not stop there. The first Concorde passenger flight after the disaster was grounded on 9/11/2001, when planes fell from the sky and sent the towers of the world trade center crashing down in ruin. Well, the echoes of the past can be heard again for those with a keen ear. Now in January of 2012, three months short of 100th anniversary of the sinking of the Titanic, the cruise ship Costa CONCORDIA lies half submerged off the coast of Italy after the captain in his arrogance and carelessness ran her hard aground on rocks that have been charted for centuries. Indeed, the name of the Italian liner also struck me. Apparently we do not live in a time of concord, as we so arrogantly presume. Indeed, this should be obvious, even without these whispers from Cassandra. Jünger also suggests that the world state will be an ephemeral phenomenon, one that will begin to break up shortly after its realization. If this is true, then one might also see the destruction of the World Trade Centers as another symbolic omen: for globalization is based, at least materially, above all on world trade. "History does not repeat itself; but it rhymes". Nice! I didn't know that comment of Twain's.